System Restore, is a fake Defragmenter tool (rogue) from the same family as: FakeHDD. Cloud Protection is a fake Antivirus. 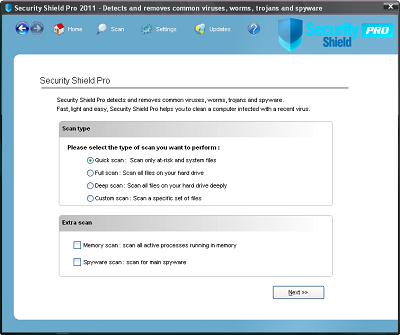 It is a clone of Guard Online, AV Guard Online, OpenCloud Security, OpenCloud Antivirus, BlueFlare Antivirus, Milestone Antivirus, Wireshark Antivirus, Sysinternals Antivirus, XJR Antivirus, AKM Antivirus 2010 Pro, Your PC Protector. Cloud Protection prevents legit softwares execution, displays fake alerts and blocks random Web pages. Guard Online is a fake Antivirus. 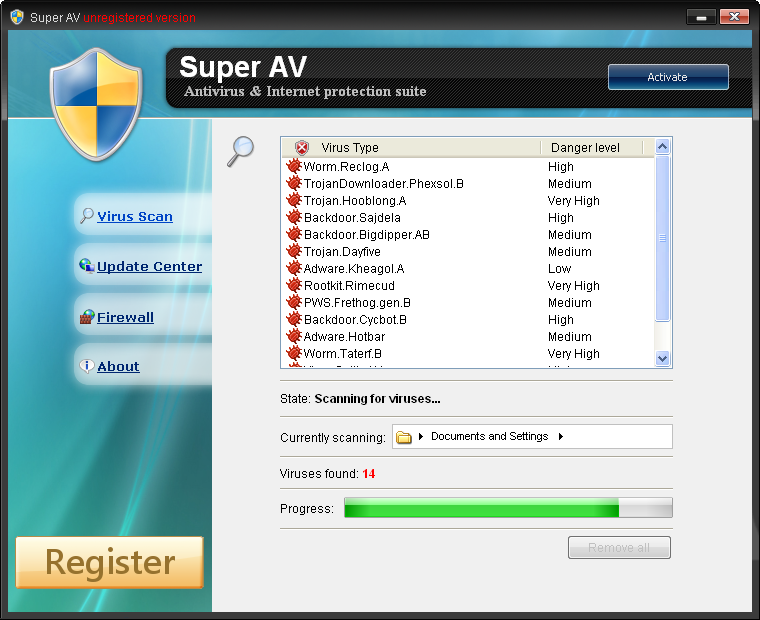 It is a new version (new GUI) of AV Guard Online, OpenCloud Security, OpenCloud Antivirus, BlueFlare Antivirus, Milestone Antivirus, Wireshark Antivirus, Sysinternals Antivirus, XJR Antivirus, AKM Antivirus 2010 Pro, Your PC Protector. AV Guard Online is a fake Antivirus. It is a clone of OpenCloud Security, OpenCloud Antivirus, BlueFlare Antivirus, Milestone Antivirus, Wireshark Antivirus, Sysinternals Antivirus, XJR Antivirus, AKM Antivirus 2010 Pro, Your PC Protector. Security Sphere is a fake anti-spyware tool. It displays fake alert messages, prevent execution of legit programs, detects inexistent infections to scare users. 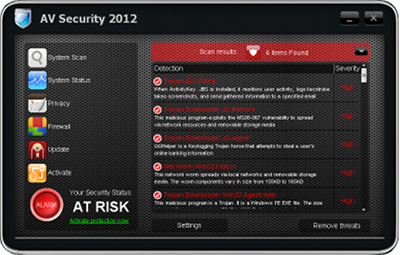 Data Restore, is a fake Defragmenter tool (rogue) from the same family as: FakeHDD. 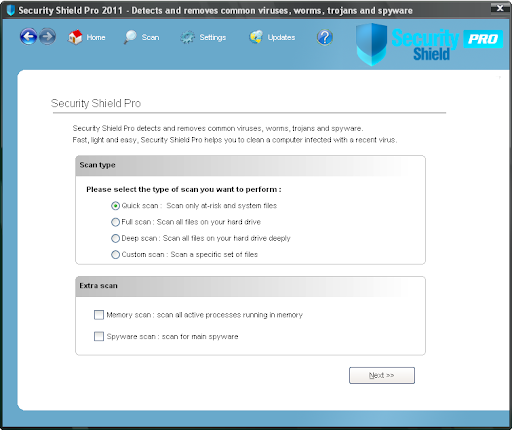 Advanced PC Shield 2012 is a fake Antivirus. It belongs to the Braviax family. As usual it displays fake warning messages and prevent legit softwares execution to push users into buying a license. OpenCloud Security is a fake Antivirus. 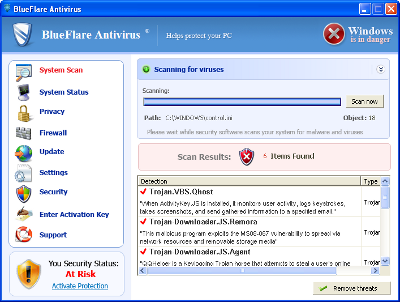 It is a clone of OpenCloud Antivirus, BlueFlare Antivirus, Milestone Antivirus, Wireshark Antivirus, Sysinternals Antivirus, XJR Antivirus, AKM Antivirus 2010 Pro, Your PC Protector. OpenCloud Security prevents legit softwares execution, displays fake alerts and blocks random Web pages. If your PC is infected with OpenCloud Security, follow Bleeping Computer's removal guide. Data Recovery, is a fake Defragmenter tool (rogue) from the same family as: FakeHDD. If your PC is infected with Data Recovery, follow Bleeping Computer's removal guide. 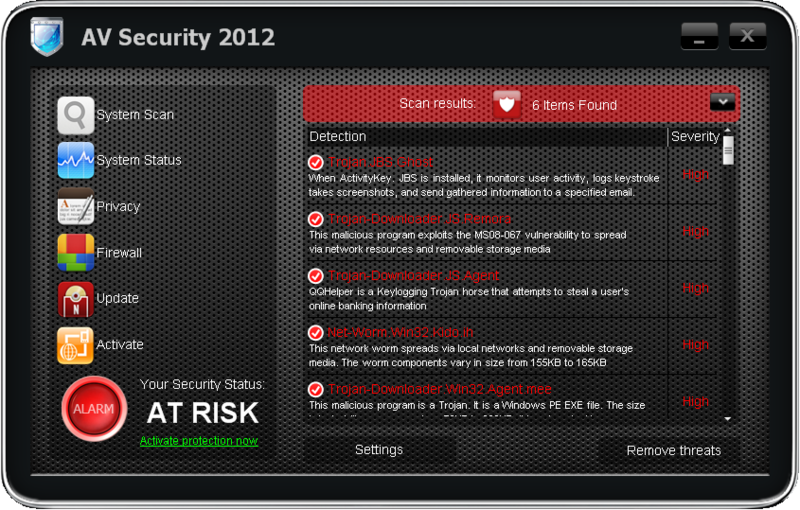 Master Utilities, is a fake Defragmenter tool (rogue) from the same family as: FakeHDD. If your PC is infected with Master Utilities, follow Bleeping Computer's removal guide. A new version of the multi-rogue scareware has been released. This malware is looking for the OS version (XP, Vista, Seven) and changes its name and skin: XP Anti-Spyware, XP Home Security 2012, XP Anti-Virus 2012, XP Security 2012 (...). It belongs to the Braviax family. As usual it displays fake warning messages to push users into buying a license. The rogue is closing legit software. You can register by entering the following serial code 2233-298080-3424 (manual registration). 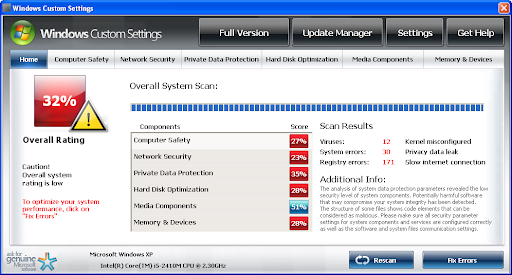 If your PC is infected with Security Protection use MBAM to remove the infection. Windows Examination Utility is a fake security application from from the same family as: Windows Work Checker, Windows Monitoring Utility, Windows Troubles Killer, Windows Protection Alarm, Windows Efficiency Analyzer, Windows Salvage System, Windows Rescue Center, Windows Crashes Deliverer, Windows Saviour Firewall, Windows Accidents Prevention, Windows Anticrashes Utility, Windows Troubles Solver, Windows Necessary Firewall, Windows Custom Settings, Windows Risks Preventions, Windows Firewall Unit, Windows Profile System, Windows Precautions Center, Windows Safeguard Utility, Windows Repairing System, Windows Activity Inspector, Windows Protection Servant, Windows Activity Inspector, Windows Tweaking Utility, Windows Tasks Optimizer, Windows Work Catalyst , Windows Attention Utility, Windows Inspection Utility, Windows Supervision Center, Windows Oversight Center. This rogue displays fake warning messages pushing users to buy a license. 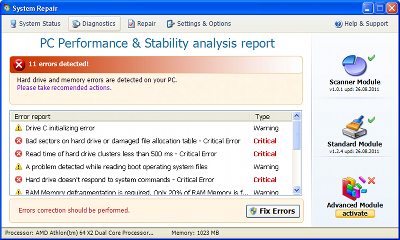 If your PC is infected with Windows Examination Utility use MBAM to remove the infection. 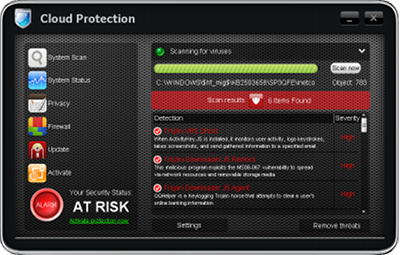 Milestone Antivirus prevents legit softwares execution, displays fake alerts and blocks random Web pages. If your PC is infected with Milestone Antivirus use MBAM to remove the infection. 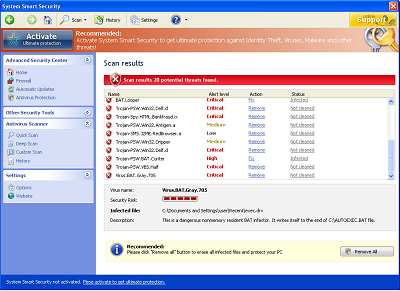 Security Central is a fake security application (rogue) from the same family as: Security Center, Antivirus Pro, Antivirus Center, Internet Protection, Antimalware Tool, System Defender, Internet Defender, Security Defender, Antimalware Defender. It displays fake infections to push users into buying a license. 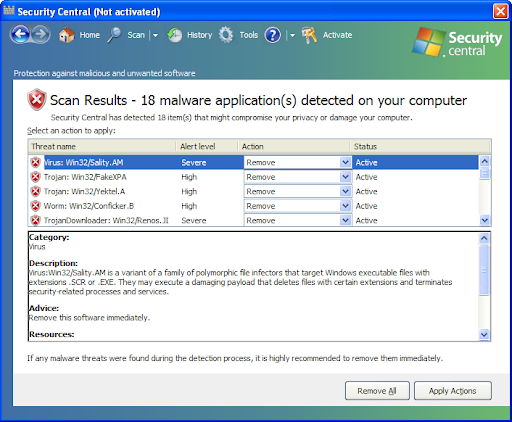 If your PC is infected with Security Central use MBAM to remove the infection. Windows Troubles Solver is a fake security application from from the same family as: Windows Necessary Firewall, Windows Custom Settings, Windows Risks Preventions, Windows Firewall Unit, Windows Profile System, Windows Precautions Center, Windows Safeguard Utility, Windows Repairing System, Windows Activity Inspector, Windows Protection Servant, Windows Activity Inspector, Windows Tweaking Utility, Windows Tasks Optimizer, Windows Work Catalyst , Windows Attention Utility, Windows Inspection Utility, Windows Supervision Center, Windows Oversight Center. This rogue displays fake warning messages pushing users to buy a license. If your PC is infected with Windows Troubles Solver use MBAM to remove the infection. Windows Necessary Firewall is a fake security application from from the same family as: Windows Custom Settings, Windows Risks Preventions, Windows Firewall Unit, Windows Profile System, Windows Precautions Center, Windows Safeguard Utility, Windows Repairing System, Windows Activity Inspector, Windows Protection Servant, Windows Activity Inspector, Windows Tweaking Utility, Windows Tasks Optimizer, Windows Work Catalyst , Windows Attention Utility, Windows Inspection Utility, Windows Supervision Center, Windows Oversight Center. This rogue displays fake warning messages pushing users to buy a license. If your PC is infected with Windows Necessary Firewall use MBAM to remove the infection. Windows Custom Settings is a fake security application from from the same family as: Windows Risks Preventions, Windows Firewall Unit, Windows Profile System, Windows Precautions Center, Windows Safeguard Utility, Windows Repairing System, Windows Activity Inspector, Windows Protection Servant, Windows Activity Inspector, Windows Tweaking Utility, Windows Tasks Optimizer, Windows Work Catalyst , Windows Attention Utility, Windows Inspection Utility, Windows Supervision Center, Windows Oversight Center. This rogue displays fake warning messages pushing users to buy a license. 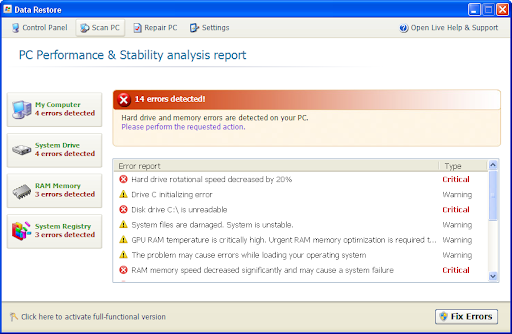 If your PC is infected with Windows Custom Settings use MBAM to remove the infection. 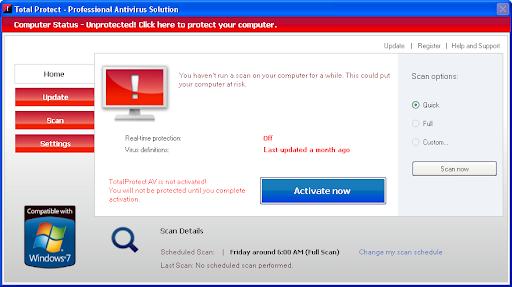 Malware Protection is a fake Antivirus tool. 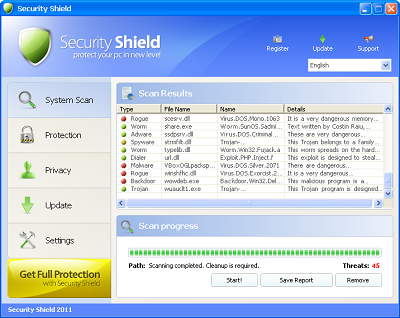 It is from the same rogue family as Spyware Protection, Advanced Security Tool 2010, Security Central, Home Personal Antivirus, XP Deluxe Protector, Win PC Antivirus, Win PC Defender, XP Police Antivirus, IE-Security, WinDefender 2009 and Total Secure 2009. If your PC is infected with Malware Protection use MBAM to remove the infection. Windows Risks Preventions is a fake security application from from the same family as: Windows Firewall Unit, Windows Profile System, Windows Precautions Center, Windows Safeguard Utility, Windows Repairing System, Windows Activity Inspector, Windows Protection Servant, Windows Activity Inspector, Windows Tweaking Utility, Windows Tasks Optimizer, Windows Work Catalyst , Windows Attention Utility, Windows Inspection Utility, Windows Supervision Center, Windows Oversight Center. This rogue displays fake warning messages pushing users to buy a license. If your PC is infected with Windows Risks Preventions use MBAM to remove the infection. Windows Firewall Unit is a fake security application from from the same family as: Windows Profile System, Windows Precautions Center, Windows Safeguard Utility, Windows Repairing System, Windows Activity Inspector, Windows Protection Servant, Windows Activity Inspector, Windows Tweaking Utility, Windows Tasks Optimizer, Windows Work Catalyst , Windows Attention Utility, Windows Inspection Utility, Windows Supervision Center, Windows Oversight Center. This rogue displays fake warning messages pushing users to buy a license. 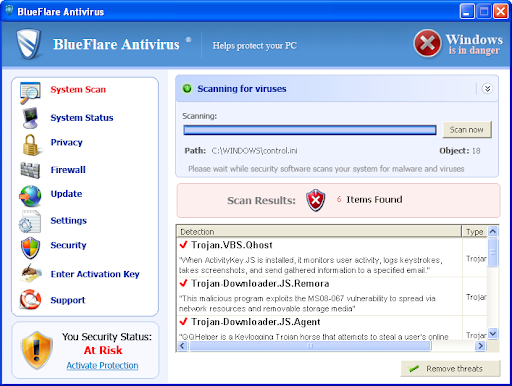 If your PC is infected with Windows Firewall Unit use MBAM to remove the infection. Windows Profile System is a fake security application from from the same family as: Windows Precautions Center, Windows Safeguard Utility, Windows Repairing System, Windows Activity Inspector, Windows Protection Servant, Windows Activity Inspector, Windows Tweaking Utility, Windows Tasks Optimizer, Windows Work Catalyst , Windows Attention Utility, Windows Inspection Utility, Windows Supervision Center, Windows Oversight Center. This rogue displays fake warning messages pushing users to buy a license. If your PC is infected with Windows Profile System use MBAM to remove the infection. 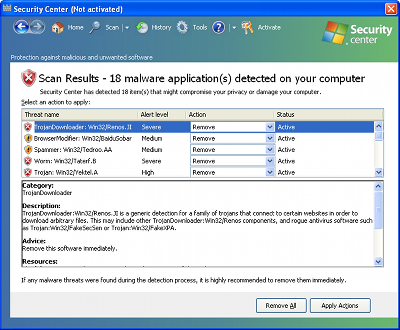 Windows Precautions Center is a fake security application from from the same family as: Windows Safeguard Utility, Windows Repairing System, Windows Activity Inspector, Windows Protection Servant, Windows Activity Inspector, Windows Tweaking Utility, Windows Tasks Optimizer, Windows Work Catalyst , Windows Attention Utility, Windows Inspection Utility, Windows Supervision Center, Windows Oversight Center. This rogue displays fake warning messages pushing users to buy a license. 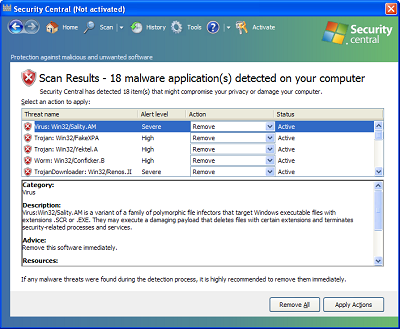 If your PC is infected with Windows Precautions Center use MBAM to remove the infection. 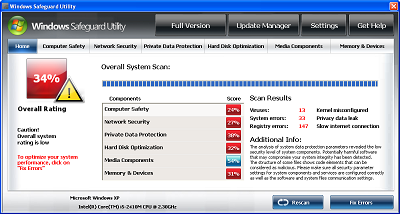 Windows Safeguard Utility is a fake security application from from the same family as: Windows Repairing System, Windows Activity Inspector, Windows Protection Servant, Windows Activity Inspector, Windows Tweaking Utility, Windows Tasks Optimizer, Windows Work Catalyst , Windows Attention Utility, Windows Inspection Utility, Windows Supervision Center, Windows Oversight Center. This rogue displays fake warning messages pushing users to buy a license. If your PC is infected with Windows Safeguard Utility use MBAM to remove the infection. Security Center is a fake security application (rogue) from the same family as: Antivirus Pro, Antivirus Center, Internet Protection, Antimalware Tool, System Defender, Internet Defender, Security Defender, Antimalware Defender. It displays fake infections to push users into buying a license. If your PC is infected with Security Center use MBAM to remove the infection. 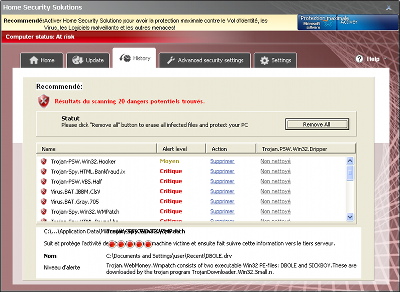 Windows Repairing System is a fake security application from from the same family as: Windows Activity Inspector, Windows Protection Servant, Windows Activity Inspector, Windows Tweaking Utility, Windows Tasks Optimizer, Windows Work Catalyst , Windows Attention Utility, Windows Inspection Utility, Windows Supervision Center, Windows Oversight Center. This rogue displays fake warning messages pushing users to buy a license. 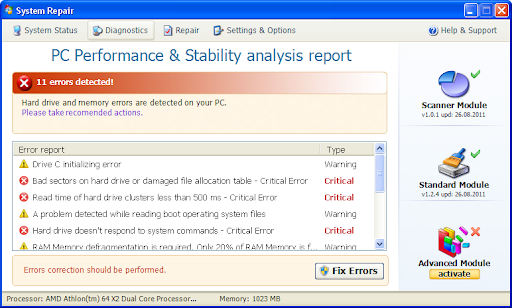 If your PC is infected with Windows Repairing System use MBAM to remove the infection.